Though often invisible to the public, traffic signal cycle lengths have a significant impact on the quality of the urban realm and consequently, the opportunities for bicyclists, pedestrians, and transit vehicles to operate safely along a corridor. Short cycle lengths of 60–90 seconds are ideal for urban areas. Longer signal cycles and corridor-based timing schemes make large avenues into barriers that separate neighborhoods rather than joining them. Under the initial conditions shown above, all users approaching from side streets incur significant delay when crossing the major corridor. The major corridor receives almost four times as much green time (96 seconds) as the minor streets (24 seconds). As a result, motorists avoid minor streets, increasing congestion on main routes. 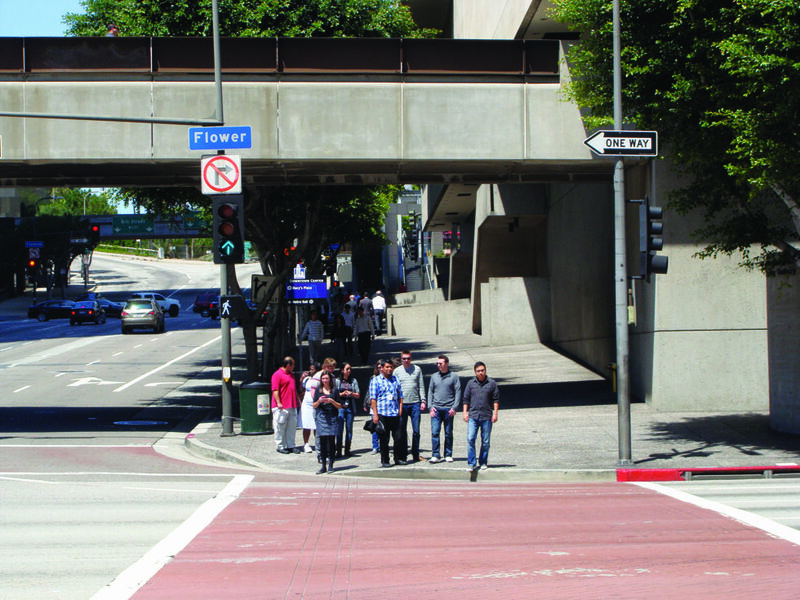 Pedestrians frequently cross the street out of frustration before receiving a WALK signal. 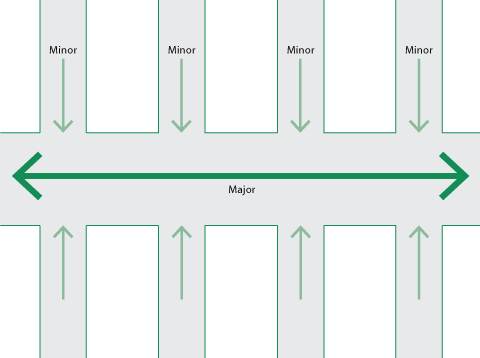 Shorter signal cycles help city streets function as a complete network, rather than a series of major corridors. In the balanced scenario, the signals are re-timed with 60-second cycle lengths. 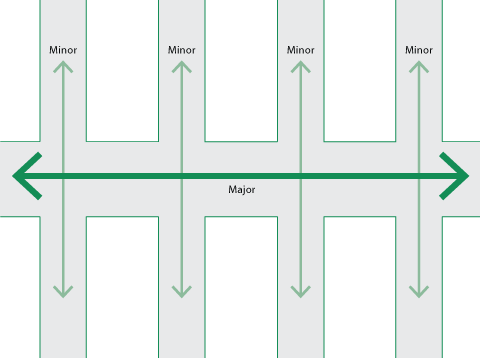 The amount of green time at each minor intersection is apportioned in a 3:2 ratio (36 seconds for the major street, 24 for the minor). The increased turnover improves pedestrian compliance and decreases congestion on surrounding streets. Short signal cycles reduce overall pedestrian wait times as well as side street delay. Cycle lengths influence the desired progression speed of traffic along a corridor. They may be used to keep speeds to a minimum as part of a coordinated signal timing plan. Longer cycle lengths result in wider variability in speeds. A minimum WALK time of 7 seconds is required (MUTCD 4E.06). Short cycle lengths of 60–90 seconds are ideal for urban areas and permit frequent gaps and consistent crossing opportunities, creating a more permeable network. The length of a pedestrian crossing should be taken into account when using shorter cycle lengths. In some cases, elderly pedestrians and children may be unable to cross in a single cycle. In these cases, efforts must be made to shorten the crossing via road diets, curb extensions, and other measures. 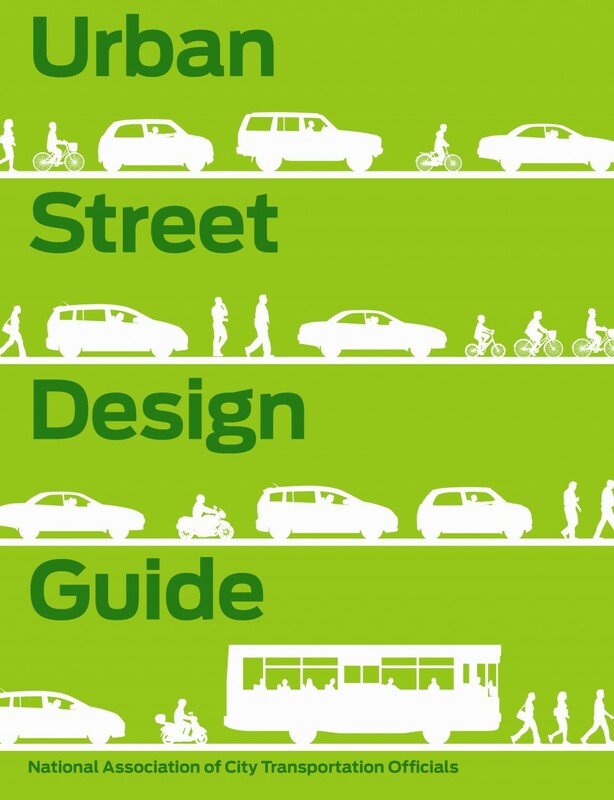 While short cycle lengths are desirable, ensure that cycle lengths are long enough for pedestrians to cross wide streets in a single leg without getting stuck in the median, unless the median is a destination in and of itself. Adaptive signal control should have limited variation in their cycle length. Operations for adaptive signal control should be limited to suburban settings and event venues where traffic is highly variable. Adaptive signal control can result in a longer cycle length that degrades multi-modal conditions. Cycle lengths may be adjusted according to the time of day to account for fluctuating vehicle or pedestrian volumes. Cycle length adjustments should be minimal and consider both pedestrian and vehicle volumes at peak and off-peak times. Ron Van Houten, Ralph Ellis, and Jin-Lee Kim, “Effects of Various Minimum Green Times on Percentage of Pedestrians Waiting for Midblock “Walk” Signal,” Transportation Research Record No. 2002 (2007). When actuated, the direction of travel with a green phase should be given ample time to safely change from green to yellow then red. The amount of time for the yellow change interval is dependent on approach speed (presumably 25 mph or less), which would require 3 seconds. The time that should be given for the clearance interval (red signal for all legs of intersection) is dependent on the approach speed and intersection width. An approach speed of 25 mph and an intersection width of 70 feet would recommend a clearance interval of 2.5 seconds. James A. Bonneson, Srinivasa R. Sunkari, and Michael P. Pratt, Traffic signal operations handbook (College Station: Texas Transportation Institute, 2009). Bared, Joe E. and Evangelos I. Kaisar. “The Split Intersection: A Solution for a Congested Intersection.” Transportation Research Board Urban Street Symposium (2000): 1-11. Bonneson, James, Srinivasa Sunkari, and Michael Pratt. “Traffic Signal Operations Handbook.” Texas: Texas A&M University System, Texas Transport Institute, 2009. Chaudhary, Nadeem A. and Chi-Leung Chu. “Guidelines for Timing and Coordinating Diamond Interchanges with Adjacent Traffic Signals.” Texas: Texas A&M University System, Texas Transportation Institute, 2000. Van Houten, Ron, Ralph Ellis, and Jin-Lee Kim. “Effects of Various Minimum Green Times on Percentage of Pedestrians Waiting for Midblock ‘Walk’ Signal.” Transportation Research Record No. 2002 (2007): 78-83. References for Signal Cycle Lengths: 4 found. Van Houten, Ron, Ralph Ellis, & Jin-Lee Kim. "Effects of Various Minimum Green Times on Percentage of Pedestrians Waiting for Midblock ‘Walk’ Signal." Transportation Research Record No. 2002 78-83, Transportation Research Board, Washington, DC. Chaudhary, Nadeem A & Chi-Leung Chu. "Guidelines for Timing and Coordinating Diamond Interchanges with Adjacent Traffic Signals." Texas Transportation Institute, Texas A&M University System, Austin, TX. Bared, Joe E, & Kaisar, Evangelos I. "The Split Intersection: A Solution for a Congested Intersection." TRB Urban Street Symposium, Transportation Research Board, Washington, DC. Bonneson, James, Sunkari, Srinivasa, & Pratt, Michael. "Traffic Signal Operations Handbook." Texas Transportation Institute, Texas A&M University, Texas Department of Transportation, Austin, TX.